When we were returning from my native place, we saw one Pied Cuckoo perched on wire beside the road. Pied Cuckoo is monsoon visitor to our area. In current season, we heard their call multiple times but do not get chance to photograph them. Naturally, we are happy get opportunity and pull over to take photographs. We observed that Jacobin Cuckoo is literally taking small deliberate jumps on the ground looking for insects and small caterpillars. Several times Caterpillar pressed from end to end to remove the guts before swallowed. 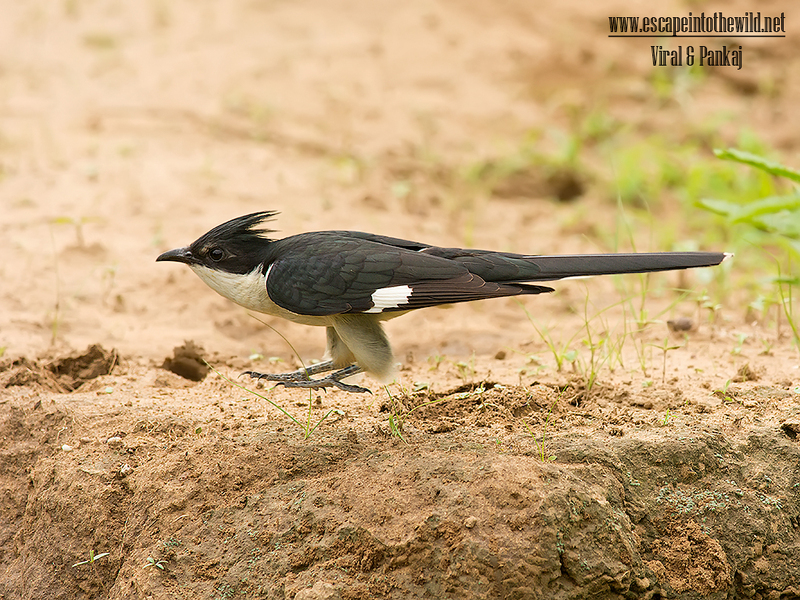 Pied Cuckoo is very energetic and little bit dare bird. It came very close to us while busy in hopping and foraging. After some time we leave the Pied Cuckoo to jumping graciously and singing happily, take with us some good memories and lovely shots. The Jacobin cuckoo, pied cuckoo, or pied crested cuckoo is a member of the cuckoo order of birds that is found in Africa and Asia. It is partially migratory. In India, it has been considered a harbinger of the monsoon rains due to the timing of its arrival. It has been associated with a bird in Indian mythology and poetry, known as the ‘Chatak’ (Sanskrit: चातक) represented as a bird with a beak on its head that waits for rains to quench its thirst. This medium-sized, slim black and white cuckoo with a crest is distinctive. The white wing patch on the black wing and the pattern make it unmistakable even in flight. They are very vocal during the breeding season. The call is a ringing series of whistling notes "piu-piu" with the calls of the nominate form more rapid and slightly mellower. The species is a brood parasite and in India, the host is mainly species of babblers in the genus Turdoides. The colour of the eggs matches those of the host, typically turquoise blue.